During July & August 2017, the Peripatetic Players will perform Shakespeare or Space Wars, described by the troupe’s lead songbird-whisperer, Princess Gwen, as “an homage to two classic star-crossed tales of destiny and daring.” I caught up with the Players during a recent respite from their grueling rehearsal schedule in Port Costa, California, where they are the resident travelling theatre troupe. A Peripatetic Performance in Port Costa, California. File photo. My first curiosity was about the name of the show, particularly its lone and ambiguous preposition: “or.” Princess Gwen explained that she coined the title herself when the Players were unable to agree on their next production, allowing the Players some extra time to iron out the details. The Players are currently deciding between realizing the long-held dream of Samuel Peaches, their troupe’s leader, to perform Mercutio’s famous “Queen Mab” speech; and conceding to the urge of their Properties Master, Thumper, to build legions of droids and spaceships. Princess Gwen takes a break from the Second Annual Samuel Peaches Peripatetic Players Particularly Obstinate Obstacle Course. Photo by Sell Fee. In past years the troupe has performed O Best Beloved, an adaptation of several of Rudyard Kipling’s Just-So Stories, and Aesop Amuck, a mashup of more than a dozen of the classic fables. “It is time we turned our attention to the literary greats,” Mr. Peaches explained, contemplating a plastic skull he had recently extracted from an antique trunk full of stage props. “While Hamlet is really the role of my dreams, I have not yet found actors able to create the properly dour atmosphere of Elsinore. So instead I will direct this troupe in our own inimitable version of Romeo and Juliet. In adapting this great story to our actors’ abilities, we have of course updated most of the language and generally butchered the play to leave only the most basic plot points,” he sighed. Mr. Peaches gestures for someone else to do something to set up FluxWagon, the Peripatetic Players’ mobile stage. Photo by Madame Directrix. When asked about the “Space Wars” angle, Thumper, an actor and the troupe’s Properties Master, eagerly interrupted Mr. Peaches. “Actually, the greatest story of all time is the original space opera trilogy created by Mr. George Lucas. We will perform the original original part of the original trilogy outdoors on our mobile stage with original props that I have created especially for this original production.” Thumper paused to inhale and Mr. Peaches sighed again. Thumper continued: “Samuel. Did you know you can do a lot in the way of space props with buckets and trash cans? !” Mr. Peaches was unavailable for comment on the props, as he was called away to autograph a copy of his recently-published tome on the art of acting. Thumper models a costume prototype. Photo by Madame Directrix. “The audience should understand that we ourselves do not entirely know how this is going to play out,” commented Princess Gwen. Ready or not, Shakespeare or Space Wars will tour July 8 – August 13 to Bay Area parks and public spaces. Tour venues will be announced on the sleekly-designed and thoroughly futuristic Peripatetic Players website. P. O. Obstacle #3: Thumper and friends Percival (aka Soren) & Rapscallion (aka Ross) hurdle a swamp, or swim a river, or all of the above. We lucked out with a bunch of sunshine for Sunday’s Particularly Obstinate Obstacle Course — THANK YOU all who came out in person or virtually to offer your cheers of support! Awesomepants (aka Kristen) momentarily trails Princess Gwen in a leap through the ring of fire held bravely by Mr Peaches himself in P. O. Obstacle #12. P. O. Obstacle #5: Awesomepants, Princess G, and a Masked Meekins expertly executing some improvised choreography. And in the BEST NEWS, we’ve raised over $500 in the 24 hours immediately following the event! Which is fantastic — because we have only until May 1 to meet our goal! In P. O. Obstacle #7, Thumper bravely takes on the role of Rebel Scum as “Storm Troupers” take terrible aim. It’s hard to see in those helmets! 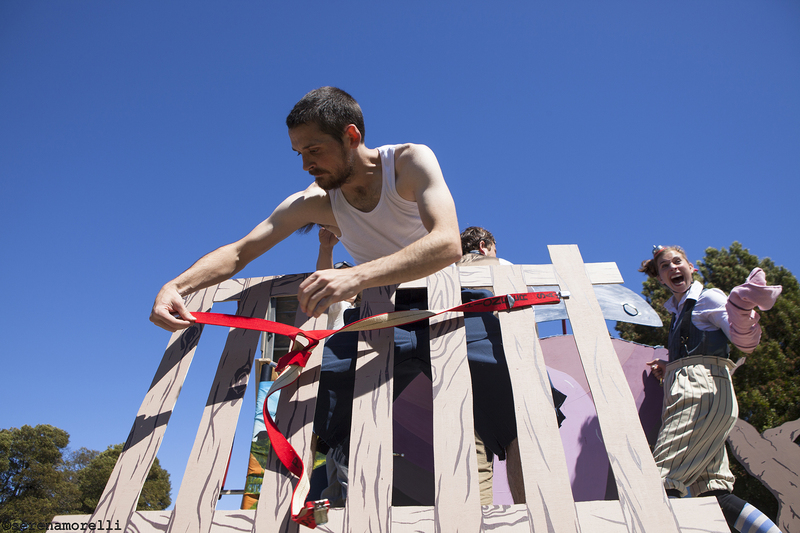 We’ll receive the funds of all pledges no matter how much we raise, but hitting our goal will go a long way toward ensuring that we can bring Shakespeare or Space Wars to Bay Area parks, offering FREE performances for neighbors of all ages. Explore the website for more about the show — and coming soon: tour dates and locations! You can also sign up for our mailing list to be in the know about upcoming shows. Awesome photos in this update from the wonderful Tim Guydish, a Peripatetic Patron who works wonders with his cameras! P. O. Obstacle #8: Tea with Mdme. D, in which obstaclers hold forth on artistic matters whilst maintaining impeccable manners. Here’s a behind-the-scenes peek at today’s Peripatetic photo shoot! Rebecca and Joan — who when not embodying Mdme. Directrix and Thumper, respectively, are the SPPP’s producing organization, Idiot String — sat down after one of the final Aesop Amuck rehearsals with none other than Sam Bertken (a.k.a. Meekins) to talk about their inspirations for both Aesop Amuck and the Peripatetic Players’ debut adventure, O Best Beloved. * Sam writes for S.F. Theater Pub,** a great blog about theatre and the independent theatre scene in the Bay Area that is run by producer, playwright & director Stuart Bousel. 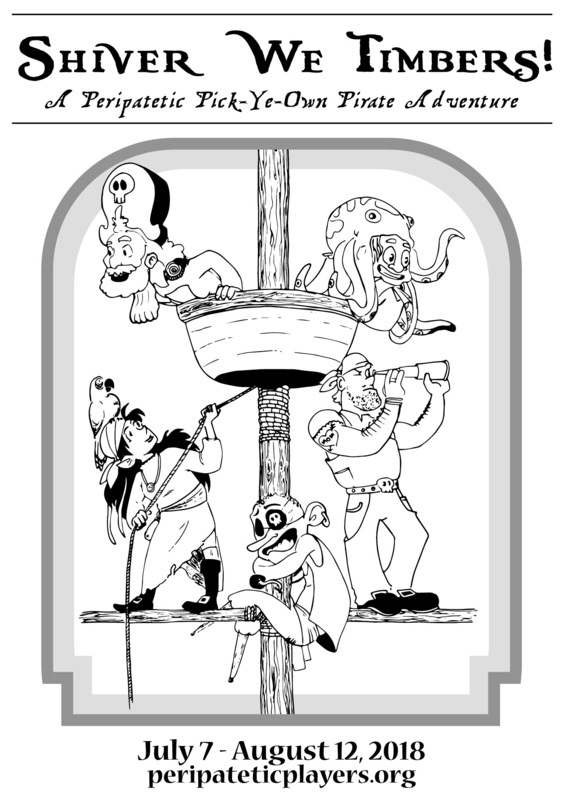 We talked about influences like Mercer Mayer & Maurice Sendak, the Muppets, and Medieval & Renaissance theatre, as well as why performing on FluxWagon and breaking the fourth wall are so important to us. Read the interview here! *Please note there are a couple words bleeped out with asterisks in this article that, if unbleeped, would be inappropriate for young audiences! **Please also note that the content of S.F. Theatre Pub in general is aimed at adult audiences, and some topics elsewhere on the site may not be appropriate for kiddos. There’s still time to donate to our Kickstarter Campaign — until late Monday night! It’s Guy, Guy Hank — our NEWEST Peripatetic Player! I just never got the chance to aspire to these dreams of mine. My Dad insisted I learn the auto mechanics trade and help build his business. I thought perhaps my dream was ridiculous and worked with him in his shop. I did, however, secretly work on my acting craft in my room reading wonderful plays and stories from around the world. I learned their lingo too – words like “blocking” and “props” and “inner monologue”. Another good thing was that since Georgia, California sees a great many travelers and tourists on their way to the beautiful sites of this Golden State, I was able to meet so many great people and hear their stories. I found that they trusted me to help get their autos to the next destination and it filled me with joy seeing them wave as they happily left our service station. Moments after they left though, I would get that sad though wishing I could travel with them. At last, the day came when the Peripatetic Players pulled into our station on their way to their next show! They needed some minor service repairs and I jumped at the chance to work on the “Flux Wagon” and was in awe that it could transform into a magical stage to share stories from. In a casual conversation to Thumper about the troupes “props”, I relayed to her my dreams and get this – she told her brother, Samuel Peaches, about my dream, my secret studies, and petitioned on my behalf to help join the troupe! Seeing that I may come in handy working on the Flux Wagon, he invited me along! My favorite story I’ve performed with the troupe to date has to be “Wind & the Sun”! Thumper and I get to compete with Samuel and Meekins (as the Wind) to see who can get a young chap (Princes Gwen) to take of her coat. There is movement and sound and it really takes off. However, I am dying to play the lion in the upcoming Aesop stories (Fables, I meant “fables”). I’ve been working on my roar, the Flux Wagon is running in top notch shape, and I am ready to take my acting to next level. My favorite person to play with is everyone in the Samuel Peaches Peripatetic Player troupe! You put me with any one of those guys and I instantly come alive. Their creativity is mind boggling – it instantly gets my own creative juices flowing. Although, I have to say, Thumper and I have really good chemistry. She just gets it, you know? She has an uncanny ability to tap into whatever is happening right at that exact moment. I would like to see the Flux Wagon pull into Georgia, California again someday so we could perform for the town. Perhaps, I could invite my Dad out so he could see what an amazing life this is! So he would know that my dreams were not ridiculous – that following your heart is the only way to go especially when you don’t know what is gonna happen. Perhaps he would be inspired by one of our stories or the morals they contain. I knew I made it with the troupe – meaning I was “in” when after weeks of rehearsal and months of only being allowed to work on the Flux Wagon, Samuel Peaches asked me to lead a story. It has only gotten better since! I can’t wait for this show to tour near YOU, our wonderful audience! May you be dazzled and delighted and maybe even inspired! Hola! Ahoj! Bonjour! from Princess Gwen! Halo everyone! Here is our fourth installment of our “behind-the-scenes/meet our players” series: Princess Gwen! My journey with the Samuel Peaches Peripatetic Players began on a clear, blue morning a few summers ago. As I was walking through the forest with my best friend Jay Robinson, I heard wonderful music coming through the trees! I followed this beautiful melody and I stumbled upon the Flux Wagon! Boy, was Fluxxie a wonderful sight after my trek through the forest! Once Samuel accepted me into the Players (maybe it had something to do with the fact that I a) can skin a wild boar in under seven seconds, b) had a bag of gold, or c) I can talk to birds), my first real break (or trial by fire) came as playing Elly the Elephant in How the Elephant Got Her Trunk. As Elly, I got to wear a tutu, travel through the Limpopo River, and head off the Precession of the Equinoxes! One of the great things about playing Elly was that Meekins played half of the silly animal duos in that story. It is always so electrifying to see what Meekins is going to come up with! Sometimes he retreats back into his memories and gets a little too intense for the kiddos, and when that happens I just let him talk to Jay Robinson and he calms back down. Anyway, thank you all for coming on the lovely adventure with Jay Robinson and myself! I can’t wait for you all to join us one sunny weekend! 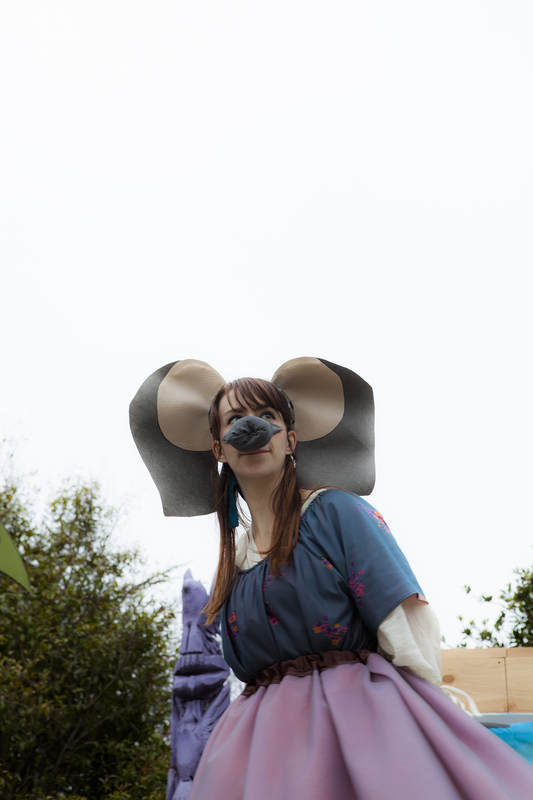 Princess Gwen as Elly in How the Elephant Got Her Trunk in last year’s O Best Beloved. Hi everyone! Here is the second installment of our “behind-the-scenes/meet our players” special: Meekins! Oh boy! Well, uh, I guess… Oh, come on, get it together, Meeks! How hard is to tell your own life story? Well, in my case, as a man who has traveled from coast to coast, sea to shore, polar ice cap to polar ice cap, I can say with total certainty: life can be a real doozy, altogether dark sometimes, unfortunately, but the happiest I’ve ever been was when I was brought in by good ol’ Samuel Peaches and his performing troupe. Ever since then, all the misadventures with Mole People, unnecessary abductions while lost out in cornfields, and head-to-head battles with mother sea lions are a thing of the past! Now, I just PRETEND to get in fights with animals, and I couldn’t be happier for it. Oh, here I go, rambling again. The way I joined the Samuel Peaches’ Peripatetic Players was straightforward enough: tasked by a mysterious witch doctor to return a crystalline skull that would presumably imbue with great power, I was kidnapped by headhunters along the rushing Amazon River. There, it seemed, they aimed to make a sacrifice to their elder gods, and had me fully trussed up like a Thanksgiving turkey! It wasn’t looking good for ol’ Meeks just then, I’ll have you know (although, I have escaped from much gnarlier situations)! Right about that time when I was beginning to maybe start saying my prayers, out of the brush came bounding the same wagon you see before you today, and atop it, seemingly having lost control, was the man himself- Samuel Peaches! He grabbed hold of the rope that I was strung up to try and stop the catastrophic caravan and ended up freeing me in the process. Of course, I was ever so thankful, and even though he wasn’t too sure, I eventually won him over with my ardent, repeated pleas for help, just like my momma taught me! Since then, I’d have to say my favorite story has been, without a doubt, the Crow. Nothing bad ever happens to him! He just dances around in a very safe manner and makes little rhymes that are of insult and harm to no one, including himself! Surely, you see the appeal? Another great thing about playing the Crow is that I get to play with the ever-so-beauteous Princess Gwen! Sure, she steals the tasty cheese I was planning on saving for myself, but she’s so nice and and strong that I’m happy to relinquish it on a daily basis at our performances. If I’m being perfectly honest with you, my dream destination for a Samuel Peaches’ Peripatetic Players performance (woo, mouthful!) would be any sort of sterile room with padded walls and ceilings where nothing is hidden and there are no noxious fumes in the air! I can’t think of anything safer than that. My fondest memory that isn’t related to an actual performance is certainly the time when Samuel Peaches finally made me a full-time performer. Up until then, I had just been chasing the caravan across desert, mountain, ocean- you name the biodome, I crossed it chasing that wagon! Finally, he stopped the wagon to do a show and I was able to meet everyone in the cast. After the show, I stowed away and pestered him with notes from my hiding place on the wagon that read, “Please please please let me be in the show please please please I’ll do anything pleeeeeaaaaaase,” until he finally sent me one back that said, “Yeah, okay, whatever.” That’s when ol’ Meekins was finally able to graduate to an actual spot inside the wagon itself. This sure wins the cake for the best thing I’ve done in my life! Cheers! Meekins as The Mariner in How the Whale Got Its Throat, in last year’s production of O Best Beloved.